Jul. 5, 2013 5:00 p.m. 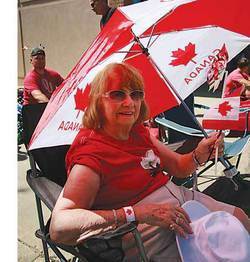 This is the 9th year that Elizabeth "Babe" (92-years-young) has come to see the 2013 Breton Canada Day parade with her family–an enthusiastic group of 25 attending from Pigeon Lake, Edmonton, and Calgary. Babe's favorites are the RCMP and the clowns.